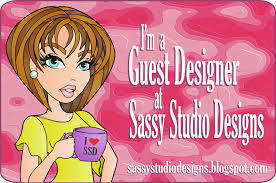 I was tickled pink to be asked to join the Sassy Studio Designs as a guest DT member. I was also a bit awestruck, as the team members are supertalented, but luckily for me they are equally friendly! This week the theme at the weekly Dare to be Sassy Thursdays challenge is Colors of Autumn, so we want to see a lot of red, gold, orange, brown or green. Quite easy to get inspired by these colors at this time of the year, right? 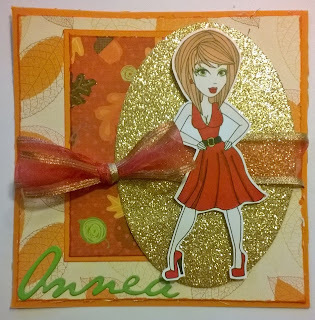 I'm also entering my card into the following challenges: Polkadoodles (Autumn/Fall colors), Dies R Us (Fall), Allsorts (Ribbons & Bows), Penny's (3 of something: 3 DPs), TTCRD (ATG) and Pile it On (Leaves). 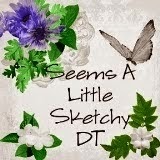 Very cute Fall creation ... congrats on the GDT spot! Thanks so much for playing in our ‘FALL’ challenge at Dies R Us! Please come back again soon! This is adorable! Love the sparkle. Thanks for joining us at Dies R Us for the 'Fall' challenge! Very sassy image, great colour and a fab bow. Thank you for entering our ribbons and bows challenge this week at Allsorts. Thanks so much for joining us at the Dies R Us Challenge! Beautiful colors!